We're trained and experienced technicians and offer great garage door repair services 24/7. Our maintenance service is thorough and will prolong the lifespan of your system. We're knowledgeable of new opener systems and their accessories in California and can offer you the best. 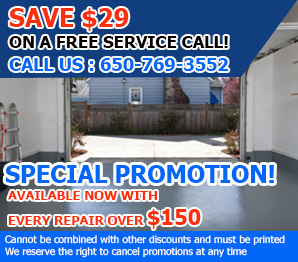 Reliable garage door repair service - residential or commercial – The best in town. Don’t let a snapped cable or a broken spring ruin your day! Call us at Garage Door Repair Mountain View instead to get a fast and professional solution. Our company specializes in fixing residential automatic doors of all types, designs and brands and covers absolutely all components including the accessories of the electric operator. You can expect quick emergency assistance from us when the problem is urgent and can’t wait for the next day. Our range of services includes installation, maintenance and replacement of doors and openers as well. Whether you have just encountered a bent track or you plan new garage door installation, you will get the service you require as soon as possible and according to your schedule. Our team has some of the most skilled technicians in California boasting with rich and diverse work experience. We use only modern tools and spare parts of the highest quality. It’s more than frustrating to be unable to take your car out of your garage or to close the door. In these and all other emergencies, you can rely on our local team to respond quickly and to eliminate the problem in the shortest imaginable time. If your overhead door is off track, we’ll identify the cause of the issue and get down to work immediately. Usually, one of the cables has snapped so you can expect quick cable replacement. The new component will have the right size and be perfectly strong. After adjusting the door, we’ll test it to ensure that it works properly. If your overhead door is hard to open or to close, the spring system most likely holds too little or too much tension. Count on us for accurate spring adjustment. We’ll increase or reduce the tension to give you reliable and safe performance at all times. When you have a broken spring, you can expect fast replacement from us no matter whether you need a new galvanized or oil tempered component. All of our replacement springs are strong and have a great cycle life. With accurate testing, we confirm that the new component is accurately installed and works as it should. Noisy chain, bowed rail or broken trolley? We have the right solutions to all of these problems with the opener’s hardware. Lubrication will make any metal chain or rod work more smoothly and quietly. Fixing the rail involves readjusting the travel limits and force to prevent future trouble. Count on us to replace all kinds of components from a broken trolley to a set of faulty safety sensors and the lost opener remote as well! When you have trouble with your automatic door’s hardware, panels or opener, count on us at “Garage Door Repair Mountain View” to fix it! You can take advantage of our installation and maintenance services any time as well. To hire our services or ask any question you have, call us or send a message online! Our response is immediate when clients in zip code 94043 are in need of garage door repair services. We offer the best service in California, have marvelous installers, are knowledgeable of all door types and maintain electric door operators efficiently.